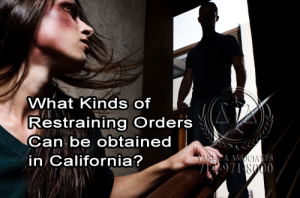 In California, a restraining order, also known as a protective order, is one type of court order that is intended to protect a person from certain actions by another person. These actions include physical abuse, sexual abuse, threats, stalking, or harassment. The person that the restraining order protects is called the protected person, and the person from whom they are protected is called the restrained person. If you are facing immediate danger, call 911 immediately to get assistance. You may also have other local resources that can help you. A police officer can request an Emergency Protective Order at any time, 24 hours a day, to provide protection immediately. A protective order is intended to protect the protected person from physical abuse, sexual abuse, threats, stalking, and harassment. There are generally three types of restraining orders that provide protection in three different ways. Personal Conduct Orders - A personal conduct order can protect several people, or protected persons, by ordering the restrained person to stop doing certain acts. These prevented acts can include the following. • Disturbing the peace of the protected person in any way. 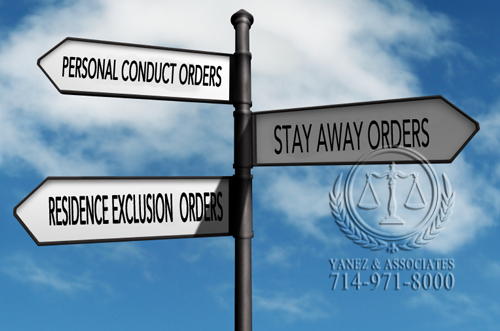 Stay Away Orders - While a personal conduct order prevents a restrained person from doing a certain action, a stay away order required a restrained person to stay a certain distance away from the protected person, or other specific places. 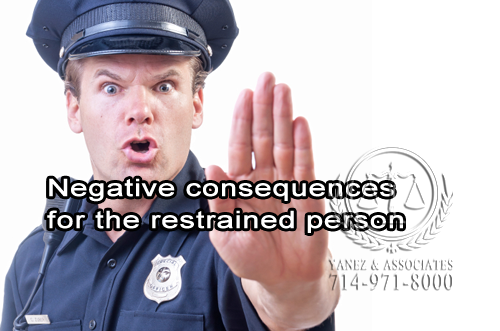 • The restraining order may also list other people or places that the restrained person must stay away from. 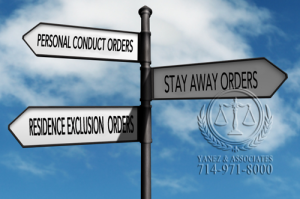 Residence Exclusion Orders - Both personal conduct orders and stay away orders prevent a restrained person from doing certain actions or being in certain places. A residence exclusion, on the other hand, requires the restrained person to move out of his or her residence if the protected person lives in the same residence. The restrained person is allowed to take his or her personal belongings, and must leave everything else behind. A residence exclusion order can only be requested during a domestic violence case or an elder or dependent adult abuse protective order case. How Else Will a Restraining Order Affect the Restrained Person? In addition to the three types of restraining orders listed above, a protective person can also cause other negative consequences for the restrained person. • If the restrained person is trying to get a green card or a visa, a restraining order may affect his or her ability to do so, and his or her current immigration status. What Kinds of Restraining Orders Can be obtained in California? • A Workplace Violence Restraining Order. Domestic violence includes any abuse or threat of abuse by a person who has a relationship with the victim. The relationship can be romantic, like a boyfriend, girlfriend, spouse or registered domestic partner, roommates or people who live together or used to live together, or people who are closely related, like parents, children, siblings, grandparents, in-laws, etc. Abuse, under California law, constitutes any of the following actions, and can include others. 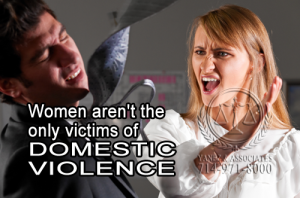 Any person who is facing domestic violence can request a domestic violence restraining order. However, due to many of the emotional manipulations that an abuser with one of these relationships to the victim can use, it is often difficult for the victim to get out of the abusive situation. If you know a person who is in an abusive relationship or who knows their abuser, encourage them to reach out and obtain a domestic violence restraining order. When a person obtains a domestic violence restraining order, he or she will have a court order that can protect them from abuse, or the threat of abuse, from a person with whom they have a close relationship. If you have been abused or threatened by a person with whom you have a relationship, YOU can request a domestic violence restraining order! 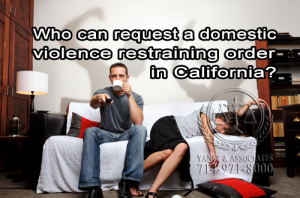 Who can request a domestic violence restraining order in California? You can request a domestic violence restraining order in California if you have been abused or threatened by a person with whom you have a relationship, like the following. • Parents of children who are facing abuse. If you are a parent and your child is facing domestic violence, request a domestic violence restraining order on the child’s behalf. Children who are 12 or older are legally allowed to file for a restraining order without an adult, but it is up to you to protect children who are under 12 years old. What If a Loved One Faces Domestic Abuse, but Does not File for a Domestic Violence Restraining Order? If you are not personally facing abuse, but you wish to obtain a restraining order for yourself or a loved one, you may qualify for another type of restraining order. A civil harassment restraining order, an elder or dependent adult abuse restraining order, or a workplace violence restraining order may better fit your situation. Always remember that if you have questions about restraining orders, or if you aren’t sure what kind of restraining order would best fit your situation, discuss your situation with a family law attorney in Southern California. If you are facing abuse and you live in an Indian tribal community or on an Indian reservation in California, the tribe may be able to help you, and you may be able to obtain a protective order from the tribal court. If you have a domestic violence restraining order from a tribal community or Indian reservation anywhere in the United States, it can be enforced in California. 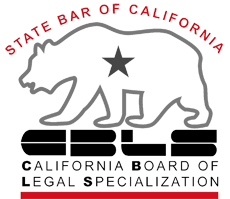 In order to have the details of your order listed in the California statewide database, have it registered with the Court. You do not have to register the order; it is enforceable even if you do not choose to register it. 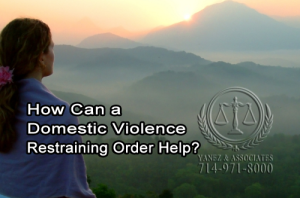 How Can a Domestic Violence Restraining Order Help? How Can a California Domestic Violence Restraining Order attorney Help my Family? As a court order, a domestic violence restraining order can require the restrained person to do the following in order to protect the protected person. • Every domestic violence restraining order is unique, and the judge may determine that it will include other stipulations. What Can a Domestic Violence Restraining Order Not Do? A restraining order will not end a marriage or a registered domestic partnership. If you wish to obtain a divorce, you will need to file for a divorce separately. However, having a restraining order during the divorce can help protect you and your loved ones. A domestic violence restraining order will not establish paternity, and cannot include orders regarding child support if paternity or parentage has not already been established. If you wish to obtain a child support order or establish parentage, you will have to file a separate case with the Court. What Happens if the Restrained Person Violates the Domestic Violence Restraining Order in California? Violating a domestic violence restraining order in California can bring serious consequences to the restrained person, including heavy fines, time in jail, or both. What If I Do Not Qualify for a Domestic Violence Restraining Order? If a person does not qualify for a domestic violence restraining order due to the relationship, or lack of a relationship between the abuser and the victim, it is likely that he or she will qualify for a civil harassment restraining order instead. In some cases, the person may also qualify for an elder or dependent adult abuse restraining order. Civil harassment in California can include abuse, the threat of abuse, stalking, sexual abuse or sexual assault, or harassment when the victim and the abuser do not have an existing relationship, or when they have a distant relationship. This means that the abuser can be a complete stranger, a family member who is at least two degrees removed, or that is not listed under domestic violence, like an aunt, uncle, niece, nephew, or cousin, or someone that the victim has met, like a teacher or a neighbor. Under California’s civil harassment laws, harassment can include the following actions. • An actual, intentional threat of violence that scares, annoys, or harasses someone without reason. Who Can Request a Civil Harassment Restraining Order? A person who has been abused, faced the threat of abuse, who has been sexually assaulted, stalked, or harassed, and who is reasonably afraid or annoyed because they have received threats of future abuse, harassment or assault can file for a civil harassment restraining order as long as the person who they wish to restrain is not someone with whom they have a close relationship. The following relationships between abuser and victim constitute a domestic violence restraining orders. • A close relative, including parents, children, siblings, grandparents, or in-laws. A person who has the following relationships with the restrained person can file a civil harassment restraining order, because these relationships are not considered to be close enough for a domestic violence restraining order. In some cases, a person may qualify for a civil harassment restraining order, but also qualify for another type of restraining order. For example, if the victim is over 65 years old, he or she may qualify for an elder and dependent adult abuse restraining order. If you find yourself in this situation, discuss it with a Southern California restraining orders lawyer who can help you figure out which type of restraining order is in your best interests. If you do not qualify for a civil harassment restraining order, you may qualify for another type of restraining order, like a domestic violence restraining order, a workplace violence restraining order, or a civil harassment restraining order. Elders who are victims of abuse are people who are 65 years old or older. A dependent adult who is facing abuse is a person who is between 18 and 64 years old, and has mental or physical disabilities that prevent the person from taking actions to protect him or herself. Abuse in these cases in California can include any of the following actions. • Deprivation of the things that the adult needs in order to prevent physical harm or physical or mental pain or suffering. Who can Request an Elder or Dependent Adult Abuse Restraining Order? If you are either 65 years old or older, or you are between 18 years and 64 years old and you have certain mental or physical disabilities that prevent you from taking normal actions to protect yourself and you are a victim of abuse as listed above, you can request an elder or dependent adult abuse restraining order. In some cases, if you meet these criteria, but the person from whom you face abuse is also someone with whom you have a relationship as listed under domestic violence restraining orders, you may be eligible for either or both types of restraining orders. Discuss your options with an attorney who has experience with protective orders in California to determine which order is best for you, or if you should have both types of restraining orders. Remember that if you do not qualify for an elder or dependent abuse restraining order, you may qualify for a domestic violence restraining order, a civil harassment restraining order, or a workplace violence restraining order. How Can an Elder or Dependent Adult Abuse Restraining Order Help? An elder or dependent adult abuse restraining order can help the abused elder or abused dependent adult by preventing the restrained person from contacting the protected person, going near his or her home, workplace, or other places that the protected person frequents, and more, depending on the type of abuse. If the abuse included financial abuse, the restrained person will no longer have access to the protected person’s finances. If it included abduction, the restrained person will not be allowed near the protected person. 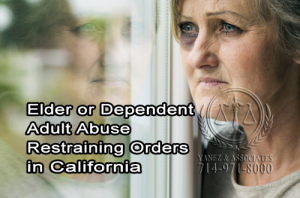 What if the Restrained Person Violates an Elder or Dependent Adult Abuse Restraining Order? 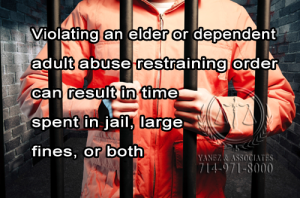 Violating an elder or dependent adult abuse restraining order can result in time spent in jail, large fines, or both. California law allows for the creation of a court order to protect an employee from violence or threats in the workplace. Specifically, a workplace violence restraining order can order a restrained person to refrain from harassing, threatening, contacting, or going near a specific employee or group of employees, and not to own a gun. Who Can Request a Workplace Violence Restraining Order? Only an employer can request and successfully obtain a workplace violence restraining order. This is significantly different from other types of restraining orders in California because rather than the person facing abuse obtaining the restraining order, a third party is getting the restraining order in order to protect an employee. An employee who wants to obtain his or her own protection in the workplace cannot request a workplace violence restraining order. Instead, the employee can ask for either a domestic violence restraining order or a civil harassment restraining order, depending on the relationship between the abuser and the victim. The employee may also be eligible for an elder or dependent adult abuse restraining order. Because a workplace violence restraining order generally only applies to the workplace, it may not be as effective as a domestic violence or civil harassment restraining order, or may work well in conjunction with another order. How Does an Employer Obtain a Workplace Violence Restraining Order? If an employer wants to obtain a workplace violence restraining order, he or she must provide proof that one of the following has occurred. • The accused person is not engaged in activities that are constitutionally protected. How Can a Workplace Violence Restraining Order Help? Workplace violence restraining orders can order a restrained person to take, or not to take certain actions. • The restrained person may be ordered to keep a specific distance from the employee’s workplace, school, or places the employee or his or her children frequently spend time. What if the Restrained Person Violates a Workplace Violence Restraining Order? Violating any kind of restraining order can result in the restrained person facing jail time, fines, or both. How Long Do Restraining Orders Last? How Quickly Can a Protective Order be Issued? How Long Do Restraining Orders Last and How Quickly Can a Protective Order be Issued? Emergency Protective Order - An emergency protective order, or EPO, can only be requested by law enforcement. The officer can call a judge, who is available to issue an emergency protective order 24 hours a day. Emergency protective orders can be issued immediately, and last for seven days, can order the restrained person to leave the home and stay away from the protected person, as well as his or her children, for up to a week. The purpose of the EPO is to give the protected person enough time to file for a temporary restraining order, which can last from 20 to 25 days. Temporary Restraining Order - A temporary restraining order, or a TRO, can be requested by the abused person. If the judge understands the need for a restraining order, he or she can issue a temporary restraining order that will last from 20 to 25 days, until a permanent restraining order can be created. Permanent Restraining Order - A permanent restraining order usually lasts for up to three years, at which time a new restraining order can be created if it is necessary. Criminal Protective Order - A criminal protective order can also be called a stay away order, and it can be created when the restrained person faces criminal charges for the actions he or she took to make the protective order necessary. It lasts while the criminal case is going on and the restrained person is also the defendant in the case. If the defendant either pleads guilty, or is found guilty, the restraining order will last for three years from the date the case ends. To obtain an emergency protective order, all you need to do is call 911 if you are facing abuse. Any law enforcement officer can make a call to a judge, 24 hours a day, to obtain an emergency protective order immediately. If you or a loved one is in danger, call 911 immediately, and ask the law enforcement officer to request an emergency protective order. Temporary restraining orders can be obtained in California by the person who is facing violence or abuse. To request a temporary restraining order, first contact your California lawyer. The first step is to fill out a Request for Domestic Violence Restraining Order, a Notice of Court Hearing, a Temporary Restraining Order, and possibly a Description of Abuse, or an Additional Page. If you have children with the person you wish to restrain, and you wish to also obtain or modify a child custody and visitation order, you will need to fill out a Request for Child Custody and Visitation Order, a Child Custody and Visitation Order, and possibly a Request for Order: No Travel with Children form. If you also wish to have a child support order, you will need an Income and Expense Declaration, a Financial Statement. If you are requesting a restraining order against your spouse or legally registered domestic partner and you wish to obtain a child support order as well, you may need to fill out an Income and Expense Declaration. Your local court may have additional forms that you are required to fill out, but your attorney can help you determine which forms you need, and help you to fill them out completely and correctly. Always have an attorney review your forms prior to submitting the forms. Always have at least five copies of your forms, in addition to the original. When you take your forms to the court clerk, the clerk will give them to the judge, who will review them, and decide whether or not to give you the orders you are requesting. Generally, for a temporary restraining order, the judge has until the following business day to decide whether to grant you the orders you requested. To find out if the judge will issue you a temporary restraining order, you should return to the courthouse when the clerk says you should pick up your paperwork. The Notice of Court Hearing form will let you know which parts of your request were granted. The judge may have granted you the restraining order, but may not have included the orders for child support, child custody, or for spousal or partner support. If you wish to obtain these orders, you can request them at your court hearing. They may be granted by the judge at this hearing, or as part of your permanent restraining order even if they were not granted as part of the temporary restraining order. This may mean that the judge wants to hear the other party’s side of the story before granting these orders. You can also choose to cancel the court hearing, which will drop your restraining order case until you decide to refile at another time. Canceling your hearing requires you to fill out and file a Waiver of Hearing on Denied Request for Temporary Restraining Order, and to stop the process of obtaining a restraining order now, before serving the person you wished to file against a copy of the forms. If you were awarded a temporary restraining order, the judge should have signed the temporary restraining order. Check to see if there have been any changes made to, or if you have been awarded all of the orders you requested. You will also receive a Notice of Court Hearing, which lists the date of your court hearing. This date is also the date when your temporary restraining order stops working, and if you still need a restraining order at this time, you will need to obtain a permanent restraining order. The order will need to be filed with the clerk, and copies of the temporary restraining order should be distributed. You should have made five copies, in addition to the original, which will be filed with the court clerk. Security personnel at your apartment building, neighborhood, or workplace should also have a copy. In some cases, you may also need to file your restraining order with the California Department of Justice, if the court does not file it for you. The restrained person needs to be notified of the restraining order against him in order for it to be legally enforced. The restrained person also has the right to be notified about the hearing taking places. To serve the other party, a third party, or server who is 18 years old or older, and not to be protected by or restrained by the protective orders has to deliver the paperwork to the restrained person. The temporary restraining order ends on the day of your hearing, and the judge cannot make a permanent order until the restrained person has been served and has had the opportunity to appear at the hearing. 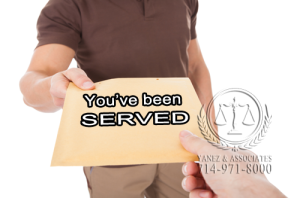 In most cases, any person who is not involved in the case and is at least 18 years old can act as a process server. You may also hire a process server, or, in the case of a domestic violence restraining order, a law enforcement officer may serve the papers for free. Once the papers have been served, a proof of service must be filed with the clerk. If the restraining order was not served on the restrained person in the appropriate amount of time, you may apply to have the temporary restraining order extended. Your attorney can help you figure out the details regarding the amount of time you have to serve papers, how to serve them, and how to extend your temporary restraining order. Always go to your hearing. Your temporary restraining order will expire today, and in order to extend it, you will need to be at your hearing. Always bring at least two copies of the documents that prove that abuse occurred. This can include photos, medical reports, police reports, damaged property, threatening letters, emails, text messages or voicemails. The judge may ask you questions at the hearing. Make sure to speak clearly and honestly, and only address the judge unless it is your turn to ask questions. At the end of the hearing, the judge will make a decision as to your permanent restraining order. • The judge may postpone your case and set a new court date if the restrained person has requested an extension, the judge wants more information prior to making a decision, or your hearing takes too long. In order to finalize the permanent restraining order, you need to review it with your attorney, and have the final order signed by a judge and served upon the restrained person. If you are in danger, it is important to contact the authorities immediately. Call 911 if you or a loved one is facing abuse or violence. If you are ready to get a restraining order, an attorney can help. 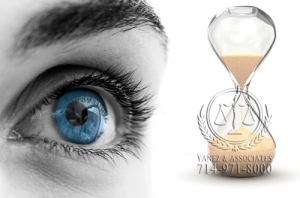 Contact us at Yanez & Associates today to schedule your free initial consultation. Our lawyers are here to help make sure that you get both the protection and the support that you need. 4 How Else Will a Restraining Order Affect the Restrained Person? 5 What Kinds of Restraining Orders Can be obtained in California? 5.2 Who can request a domestic violence restraining order in California? 5.4 What If a Loved One Faces Domestic Abuse, but Does not File for a Domestic Violence Restraining Order? 5.6 How Can a Domestic Violence Restraining Order Help? 5.7 What Can a Domestic Violence Restraining Order Not Do? 5.8 What If I Do Not Qualify for a Domestic Violence Restraining Order? 5.10 Who Can Request a Civil Harassment Restraining Order? 6.1 Who can Request an Elder or Dependent Adult Abuse Restraining Order? 6.2 How Can an Elder or Dependent Adult Abuse Restraining Order Help? 6.3 What if the Restrained Person Violates an Elder or Dependent Adult Abuse Restraining Order? 6.4 How Does an Employer Obtain a Workplace Violence Restraining Order? 6.5 How Can a Workplace Violence Restraining Order Help? 6.6 What if the Restrained Person Violates a Workplace Violence Restraining Order? 7 How Long Do Restraining Orders Last? How Quickly Can a Protective Order be Issued? What is an Automatic Temporary Restraining Order ATRO and how does it work in Orange County California?